Since March of 2017, I worked full-time as a rotating two-year-old teacher at Park Place Children's Center. Near the end of August 2017, the children moved up to their new classes, and I enjoyed getting to know three new groups of two-year-old children. The rotator position is the best of all worlds: It demands flexibility (I haul my box of tricks from one room to the next). But I don't have to try to squeeze in monthly assessments, schedule parent conferences, or send out parent communications, as the lead teachers must. I am still free to come up with cool ideas for learning, but most of all I simply get to enjoy the kids. I'm the fun teacher, and the kids look forward to their "Mrs. Katie" days. 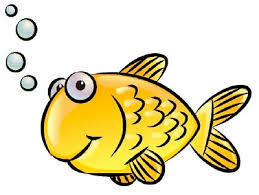 In February 2018, I accepted the position of lead teacher for the Goldfish class. Making each day interesting does take more effort on my part, but I enjoy the rewards. The children loved the day I brought lots of B-food items in my surprise box: broccoli, bananas, blueberries, brussel sprouts, beets. Some of the children ate broccoli raw and begged for more! The next week C-foods were equally exciting--carrots, cabbage (they felt how heavy), corn (they helped to husk it), and cranberries (small). My train whistle means, "Line up! We're going out of the room!" 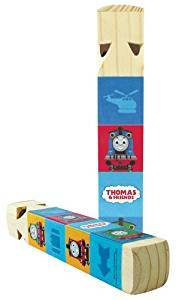 A yellow train track marks the spot where they line up. I've added new items to the sensory table nearly every day (sadly, many teachers do not use the sensory table on a consistent basis): various forms of pasta, beans, green peas, and now sand. I managed to convince the administration to buy four new costumes (sturdy Melissa and Doug outfits that the children love--fire chief, police officer, doctor, and construction worker). And I introduced a new center--a store with a retro Fisher-Price cash register that the kids love. I used the Learning Resources Farmer's Market Color Sorting Set and A-Z Alphabet Grocery Set. I aim to order the Learning Resources One to Ten Counting Cans too. Park Place Children's Center (where I work) offers a schedule filled with various activities. Each two-year-old class enjoys half an hour on the playground in the morning and in the afternoon. 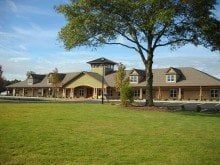 In addition, two-year-old classes enjoy twenty minutes outside the classroom for enrichment, Spanish, library, and gym. Of course there's breakfast, lunch, and nap time as well. The rest of the day is spent in the classroom either in circle time or free-play in various centers. I work to make that time interesting and relevant to the children. For Valentine's Day, I taught the children how to set a table. They used plastic tableware and some old place mats and napkins that I inherited from my mother-in-law. The kids were so excited about helping their parents! They did pretty well learning too. Tomorrow I am bringing in the new ukulele my husband very kindly bought me for Valentine's Day. I hope to enjoy more music with the children (nursery songs and folk songs). Do I get tired of all the repetition two-year-olds require? Not really. I'm shaping minds and hearts, always an interesting challenge if one tries her best to study and understand and reach each different child. Am I tired at the end of the day? You bet! I don't typically have much energy left to pursue my writing interests. But it's a satisfying kind of tired. All summer and then some I took a break from blogging. In late May I attended my granddaughters' dance recitals. In June I enjoyed spending time with my family at a mountain resort in North Carolina. I finally got around to planting my flower garden in late June. We chilled at home and watered it during July and August. In early September, I attended my niece's wedding in Minnesota and enjoyed visiting with my brother and sister and nieces and nephews. The two-year-olds had grown in their ability to listen to stories (by this time in the school year, most of them had actually turned three years old). 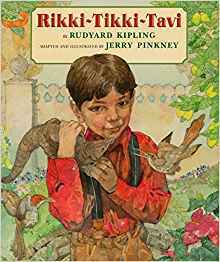 So although the book is longer, I was able to read the story to them in two pieces (first Rikki Tikki Tavi's arrival in the garden of the English family to the killing of the little poisonous brown snake Karait--then later the scary but brave battle against the cobras). The illustrations are fabulous! The children enjoyed identifying Darzy and his wife, Chuchundra the Muskrat, and Nag and Nagiana. They also enjoyed repeating Rikki-Tikki-Tavi's war cry (Rikki-Tikki-Tikki-Tch!) and mimicking his perfectly balanced dance and jump. Needless to say, I read the book to the two-year-olds more than once, as they revel in repetition. My other summer favorite was Margot Fonteyn's Swan Lake, a re-telling of the story behind Peter Illych Tchaikovsky's classic ballet. The plight of the swan-queen and the transformation of Count Von Rothbart into the evil owl-magician captivated the children. The concept of malicious deception (tricking Prince Siegfried into thinking Odile was really Odette) seemed new to them. To me, this is a valuable lesson to learn in life--one better learned vicariously through this story than through real-life circumstances. I was able to read this story to a group of four-year-olds and two groups of three-year-olds without much modification. 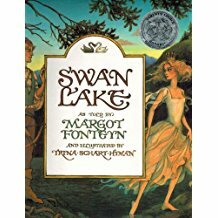 I occasionally rephrased sentences knowing that the children would not understand "Prince Siegfried was transfixed by Odile" (he couldn't take his eyes off her) or "the maidens were distraught" (the swan-girls were crying, so upset that they couldn't answer Prince Siegfried). The book refers to Prince Siegfried's mother as a princess, a name the children found confusing. and so I called her the "Queen Mother" instead. For the two-year-olds, I glossed over a lot more, particularly the tragic ending. I focused instead on moral: The power of their true love was greater than all the forces of evil added together. The three-and-four-year old classes enjoyed making a ballerina craft, which we glued to skewers so that they could make the ballerina twirl. That turned out to be a popular craft even for the boys, some of whom drew or decorated male dancers instead. Parents were impressed with the tactile use of the craft; however, I did not attempt the craft with two-year-olds. The children also enjoyed listening to clips of Tchaikovsky's music and trying to guess where the swans were dancing and where the evil owl-magician comes in. The turbulent music scared a few two-year-olds, so I had to limit the clip. Overall, parents enjoyed having their children exposed to the idea that music can tell a story. From Rikki-Tikki-Tavi the children learned bravery. From Prince Siefgried and Odette they learned both wisdom and love. Valuable lessons in life, and they had fun learning. That's the best part. See why I love teaching preschool? Here it is--May 2017! March and April have flown by without a word from me. I have been busy playing trains and reading stories to young children. I love watching how stories affect them and develop their thinking skills. 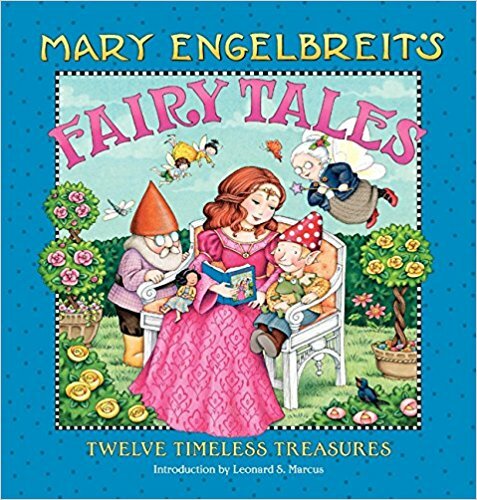 The younger children (two to three years old) really love listening to Mary Engelbreit's Nursery Tales and Fairy Tales. They love the large, colorful illustrations, and the wording typically doesn't drag or dawdle on details. Repeated lines attract. But the children also love participating in the storyl. They love when I let them play a character and unanimously chant "Not by the hair of my chinny-chin-chin!" or "Rapunzel, Rapunzel, let down your golden hair." They love sniffing the bears' porridge with Goldilocks, huffing and puffing with the wolf, and giggling with the gingerbread boy. I also work with a four-year-old class (many of whom have just turned five). 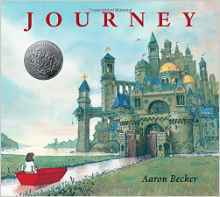 They were captivated by the wordless picture books by Aaron Becker (Journey, which won a Caldecott Honor Award, and its sequels Return, and Quest). I "read" it with them by pointing to details and asking questions ("What is the girl doing? Is she happy? Where is she looking? What do you think she is saying to her father?"). The story has to be teased out of the pictures. Kids are so used to being told a story that discovering it for themselves becomes a refreshing change for most of them. Today I finished reading a fantasy novel that one of my sons recommended: The Name of the Wind by Patrick Rothfuss. I thoroughly enjoyed reading it, but I was amazed at how snobby and hateful some of the reviews on Goodreads.com were. Though his books have some of the highest ratings (lots of 5-stars), they have also garnered a collection of 1-star or 2-star ratings. Why? Some reviewers slam his writing style, saying that it's full of cliches and riddled with "telling" not showing. Some criticized him for a lack of action and world-building, complaining that the story was slow a read. I disagree. I don't read a ton of fantasy, but I thought the author's creation of "sympathetic" magic and the herbivorous dragon both original and clever. The Arcanum (university) appeared a well-thought-out new world to me, and I loved the elegance of the author's wording and the pacing of action. I rather like stories that provide insight on life. What an eye-opener on how harsh readers can be! Patrick Rothfuss published his first book The Name of the Wind around 2007. The sequel The Wise Man's Fear was released in 2011. Readers are anxiously awaiting the third book in the series (Doors of Stone), and several have lost patience, rudely slamming him for the six-plus years of delay. I wonder if they have ever attempted to write a novel. Do these critical readers know how difficult it is to create an original yet consistent new world with a compelling yet coherent plot? Creating unique yet believable characters and weaving them into crucial points of the plot is not easy either. Choosing the right phrasing can be tedious too, not to mention seemingly revisions required by editors. Do they understand that producing a quality book is an extended process? Analysis and evaluation are so much easier. Reviewers should remember that. 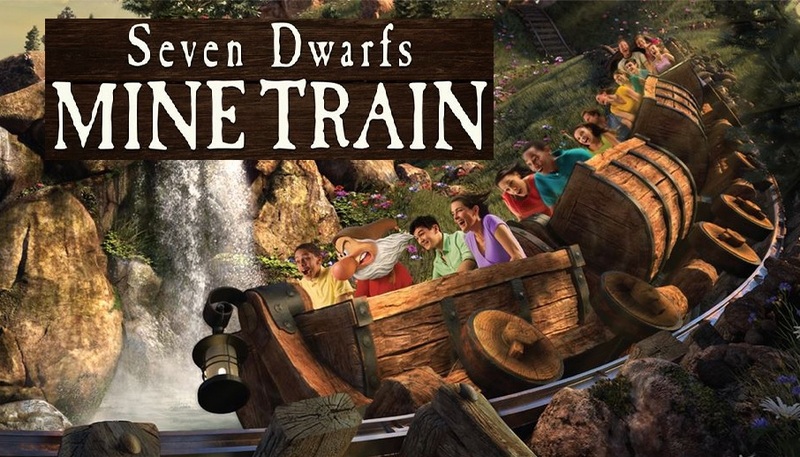 Remember that roller-coaster feeling? You go up with nervous anticipation and down with a scream. A ton of giggles follow because you're embarrassed that you reacted in such a way. But it feels so good to be free to react rather than gripping the safety bar with rigid terror that you don't really care what people think after all. Your senses are on overload. You slow down to enjoy some scenes but whip past others. And before you know it, the ride is over. Such good moments are sweet. Will they stay? Perhaps not. This too shall inevitably pass. But while it lasts, I'll enjoy the affection of little friends and the opportunity to amuse them with stories, songs, and games. How does one deal with disappointing circumstances? People are different. Some shrug off the bad news and go on their merry way believing whatever they want. One of my trust clients did that. According to his story, when he was in his sixties, his doctor told him he had cancer. "Is that so?" he responded. He simply ignored the bad news and lived into his mid nineties. But not all of us are capable of such blind optimism--or so fortunate as my trust client. Things happen in our lives that cause us disappointment and pain, and we have to find a way to live with the pain--or through the pain. On days that I am discouraged (as I am today), I think of my grandfather's courage. After the sudden death of my father due to a heart attack in 1983, our family argued heatedly over what should happen to my grandfather, my father's father, who was 91 at the time and had been living with my parents, having sold his home. My parents had not managed their finances well, and my mother was left with very little income for several years, until she was able to draw a Social Security check. My grandfather was a saver all of his life, and my parents had often relied on his generosity and funds to pay the taxes, buy a new car, and so on. However, my mother did not get along well with my father's parents. My dad was an only child who felt a close connection to his parents. My mother felt that he should listen only to her.. She pushed her agenda hard, and my father's parents pushed back. The friction often made life miserable for Dad and for us children as well. So when Dad died, we argued about Grandpa's future. At the time, I'd been married for five years and was a stay-at-home mom with three preschool children. We didn't have much, but we'd taken my grandfather into our home before, when my mother grew overly annoyed with him and more-or-less threw him out for months at a time. We had served as the pressure valve. Mom would eventually take Grandpa back because she pitied him living with my awful cooking skills or because she deemed me too incompetent to administer the strict regiment of eye drops after his cataract surgery. At the heated family meeting, my older sister, who lived in California with her four children and worked full-time, insisted that Grandpa should stay with my mom. After all, if she (my sister) couldn't handle taking care of Grandpa, who could? My sister was normally so distant and disconnected that I didn't feel she should have any say. What did she truly care about Grandpa? She rarely even wrote to him. My husband and I offered to care for Grandpa and let mom keep control of his funds so she had means to live. My brother sided with me and offered to help us with Grandpa's care despite the fact that he and his new wife had just become parents. I loved my grandfather. I couldn't bear to see him suffer at the mercy of my mother, who could often be cruel and cutting with her words and actions. But in the end, Grandpa made the decision. He would stay with Mom. Tears ran down my cheeks when he announced his choice, but I didn't say a word. He knew his mind, and I respected his wishes. My mother left the family meeting in a huff, smug with her sudden victory. I sat down at the piano and played, "Home, Home on the Range." My husband has never liked the song since. Why? I played with the despair of the ages eating my heart. The song was meant to relish the peace of the open range, but my despondent gloom leached all hope and comfort from the lilting tune. I felt the line "Where never was heard a discouraging word" an impossibility in my life. 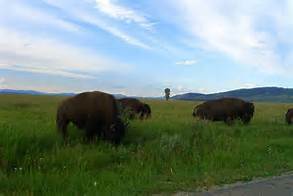 Discouragement lay everywhere, like flood-mud blanketing the prairie so thick one could hardly trudge through the muck. Grandpa rolled his wheelchair beside the piano and interrupted me: "You play as if you've lost your last friend in the world." Then he revealed why he'd made his decision to stay with my mom. He knew Dad had not provided properly for her and felt it his duty to make sure she had means to live. I should have admired his courage, but all I could think of was the agony I knew he would face. It was hard to go on. Before my dad's sudden death, my husband and I had been planning to move to South Carolina. In the family meeting, we offered to put our plans on hold indefinitely to take care of Grandpa, but my mother in her stubborn pride rejected any help. Interference, she called it. So we moved anyway. I wrote to Grandpa regularly and called him off and on, despite the cost of long-distant calls and our tight finances after the move. Eventually, he fell and broke his hip. My mother let him lie there on the floor, insisting he should get up on his own, before she called an ambulance. She didn't have to tell me she enjoyed gloating over his misfortune. The smug tone in her voice when she related the incident conveyed what he had suffered. Grandpa died in a nursing home a few months later, after enduring a painful bowel obstruction procedure (something he had always dreaded). But the last time I spoke to him, a few days before his death, he was still cheerful, flirting with the nurses and thanking me for my most recent letter. When Mom called to let me know he'd died, she relished the reason she supposed for his finally giving up the ghost: Grandpa chose to die because his money had run out and he was too proud to live off a welfare check. This "reason" was conjecture on her part. I knew that, but the jibe still hurt. She loved to lord it over him. Life is full of hurt at times, hurt that runs deep. As human beings, we have to learn how to let life go on. We have to pick ourselves up and try again. We have to brush off the heritage we don't want and embrace the one we admire. We have to strive to emulate those with honorable character--like that of my Grandpa, who somehow mustered the courage to do what was right and cheerfully face the obstacles he encountered in the process. What do these thoughts have to do with writing? A writer's job can be lonesome work. It's easy to become discouraged, especially when people criticize your work or simply just ignore you. In times of discouragement, we as writers need to find ways to get through those low moments. We can't rely solely on family members or friends to buoy us up. Yes, having the "cheer team" on hand every second of the writing game would be nice. But such a life does not exist (at least not for most of us), and so we must somehow find the energy and determination to motivate ourselves, to encourage ourselves. The art of encouraging ourselves isn't an act of pride. Putting on rosy-colored glasses and lying to ourselves about how good our writing is won't help us, at least not for long. Encouraging ourselves means we grant ourselves the courage to recognize faults and get to work fixing them. It means believing in ourselves enough to say, "You go, girl. Tackle the task and get it done." After all, we have something worth saying. What we have to say might not necessarily appeal to everyone, but it will likely resonate with someone. Help someone. Encourage someone. Amuse someone. Teach someone. That's why we write.